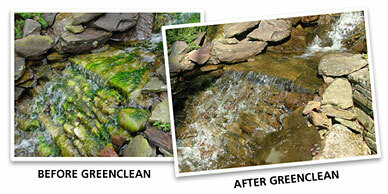 Unlike other aquatic algaecides on the market today, GreenClean Granular Algaecide works on contact to control algae in water gardens, ornamental ponds, fountains, and other water features. GreenClean Granular Algaecide does not harm fish and aquatic life, including Koi and Other Sensitive Fish, and starts working instantly! GreenClean Granular Algaecide also quickly eliminates algae on a wide variety of surfaces such as birdbaths, statues, walkways, and roofs. Through its patented formula, GreenClean Granular Algaecide immediately begins fighting algae blooms, releasing vital oxygen into the water body as it biodegrades. GreenClean Granular Algaecide is sold through independent retail garden centers, water garden supply stores, and other pond supply venues.